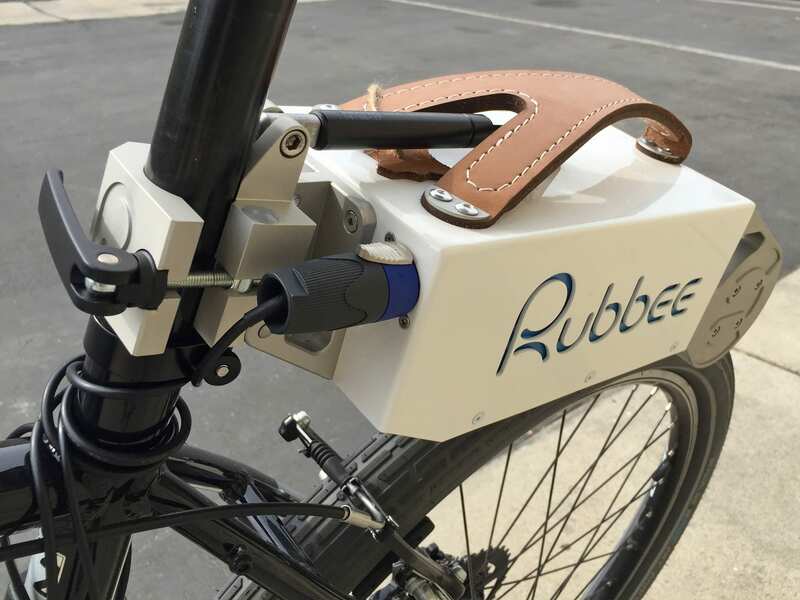 A portable, all-in-one electric drive system designed to work with most traditional bicycles, folding and full suspension included! 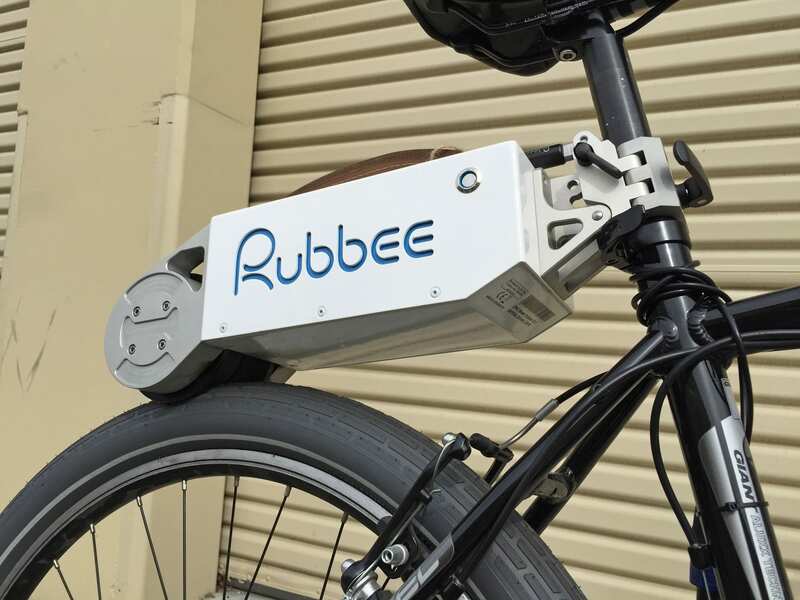 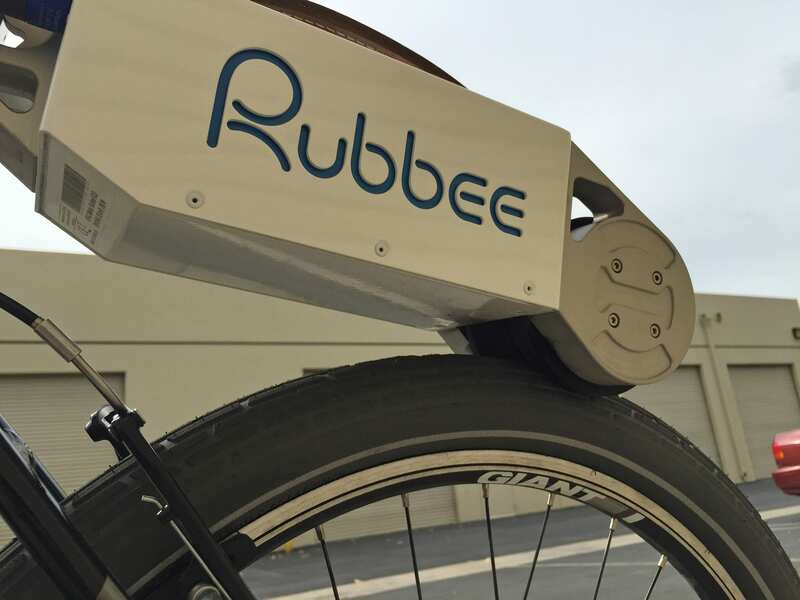 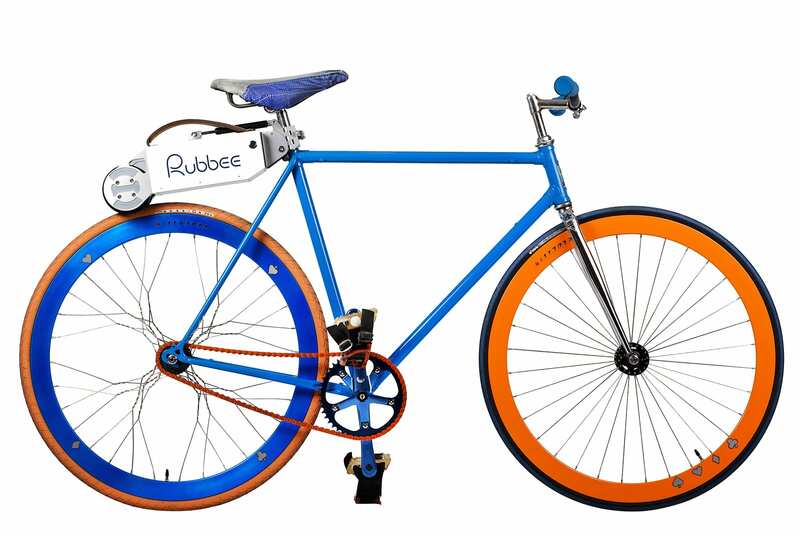 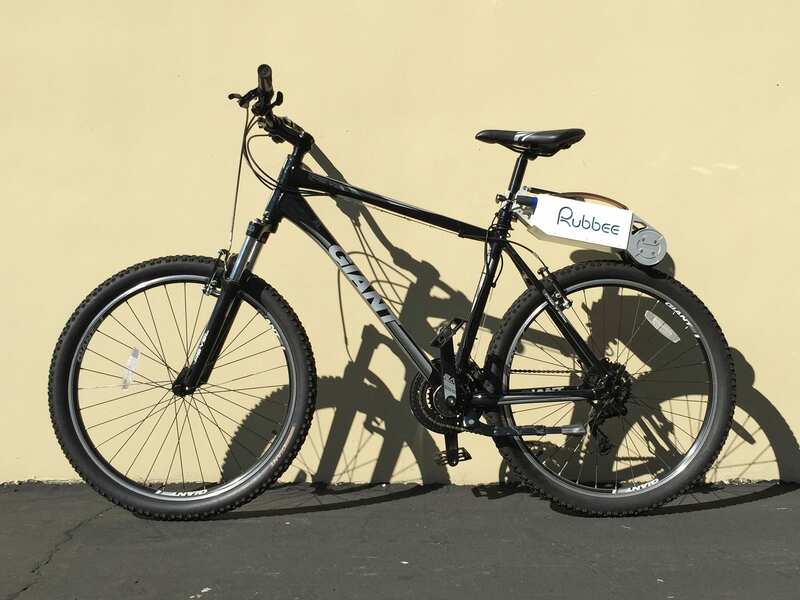 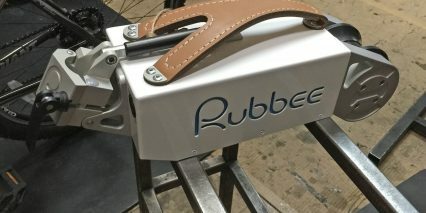 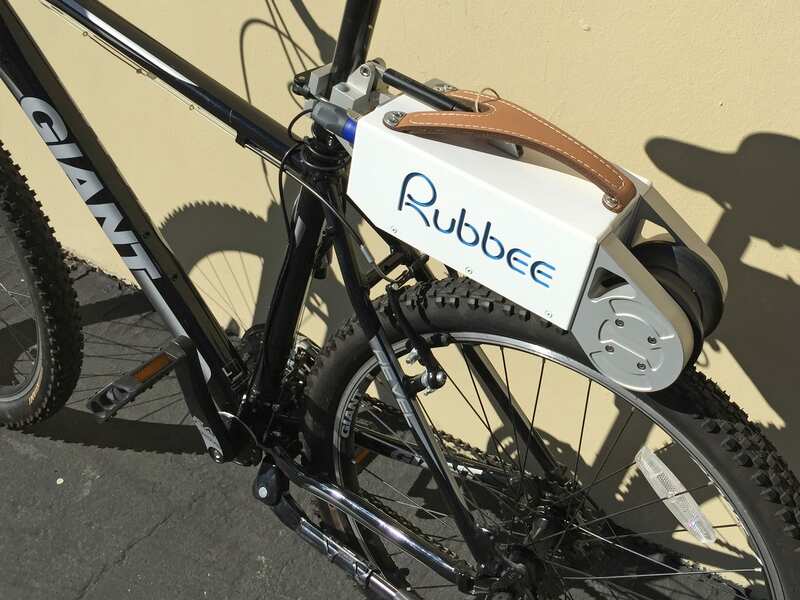 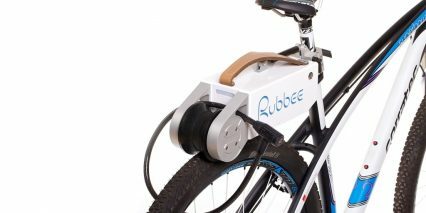 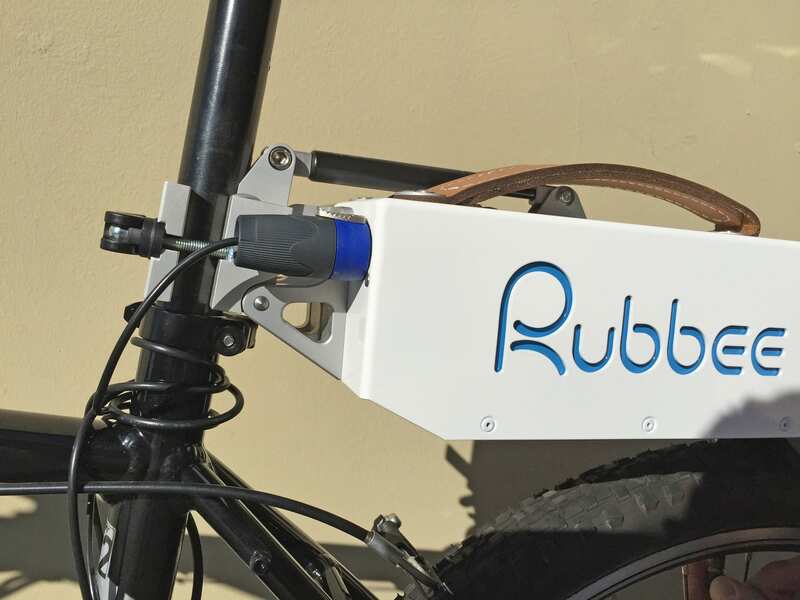 The Rubbee is an affordable electric drive system designed to clamp onto the back of nearly any regular “human powered” bicycle and convert it into an efficient “pedal assisted” ebike that will climb easier and go further. 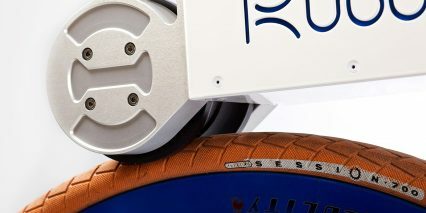 I love the aesthetics on this thing, a lot of attention was paid to the paint job, routed logo, integrated LED backlight, twist-click power connector, beeping alert system and easy-install pedalec sensor. 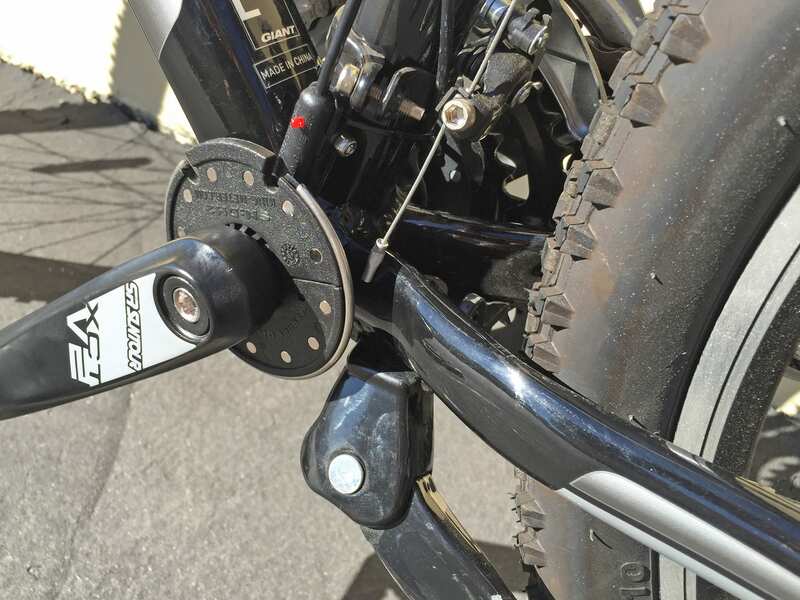 Unfortunately, compared to most of the purpose built and converted electric bikes I’ve reviewed (that rely on hub motors or mid-drive systems) it feels under powered. 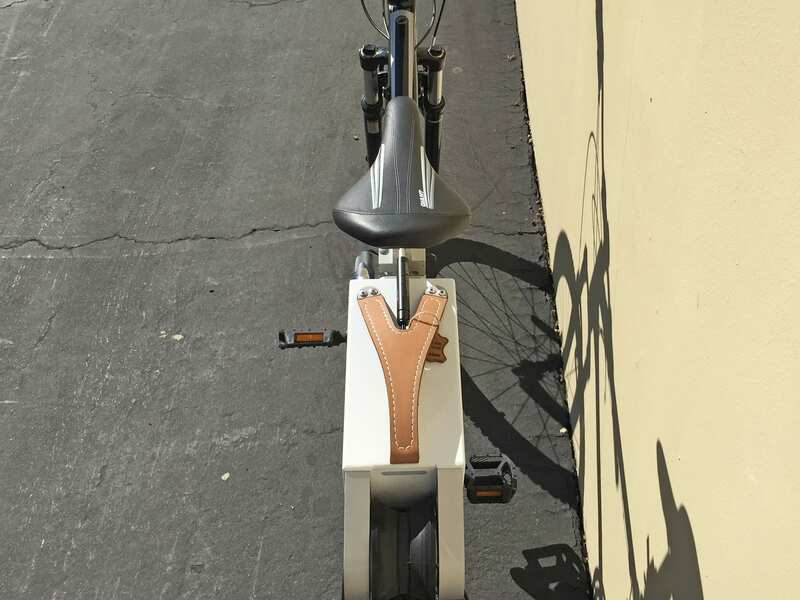 I’ve tested other ebikes that were limited to ~15 mph (designed to satisfy a European and global market) but this one felt slower and less zippy. 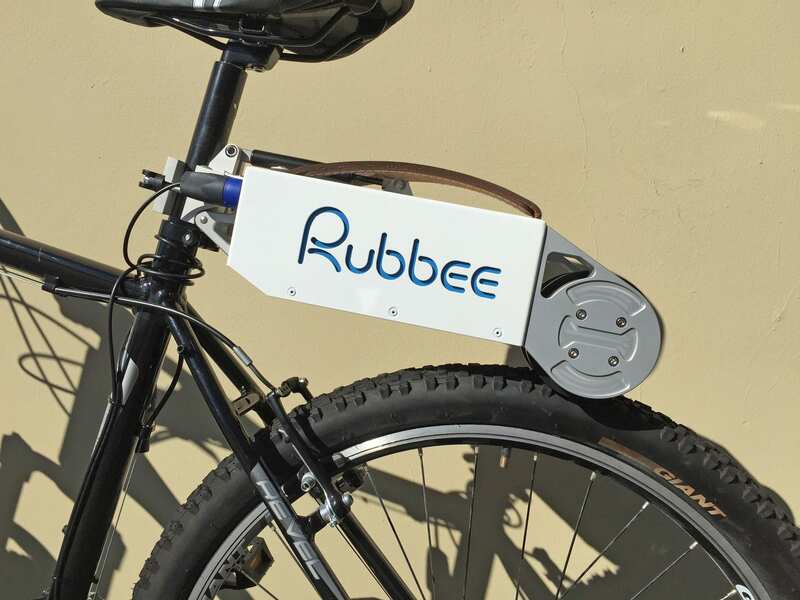 There’s also no display panel showing your distance, charge level or speed so the Rubbee feels a bit detached. 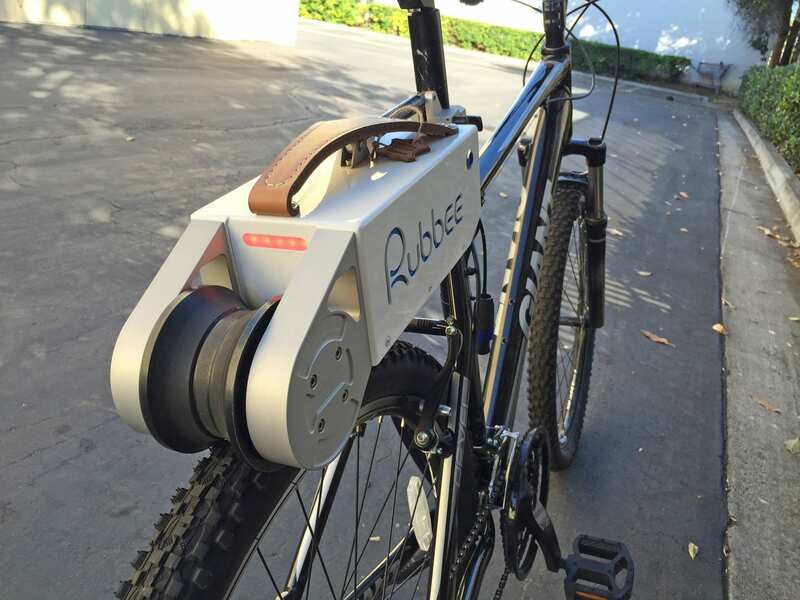 One thing is for certain, running out of batteries far from home would be a big bummer. 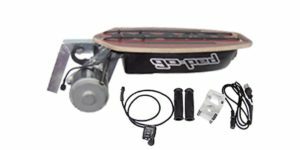 The entire kit (drive system, wires and pedal sensor) weigh just under 16 pounds (7.3 kg) which isn’t too bad but the rubber friction drive slows you down if it isn’t powered on as demonstrated in the video. 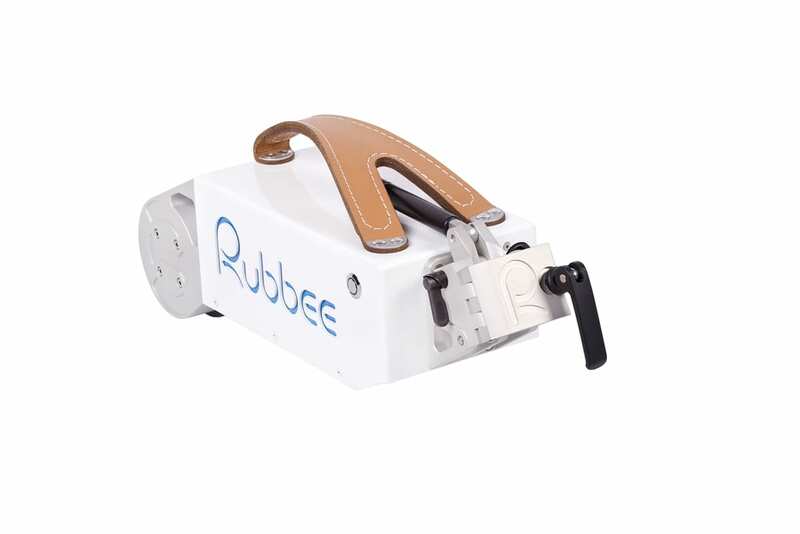 While it is possible to “disengage” the Rubbee and coast more efficiently, you may risk breaking the locking pin that holds it up. 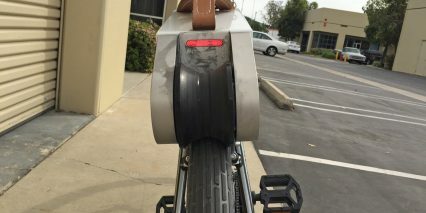 This actually happened during our tests while walking the bike off of a curb and from then on the unit was permanently engaged. 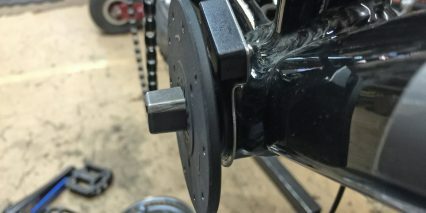 I’m told that the pin is actually designed to break off clean (as it did for me) so that it can be replaced vs. being bent and jamming in the “up” position. 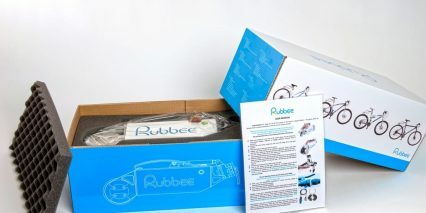 This is a difficult review to do because the Rubbee team has been very responsive and professional, their two year warranty is excellent and the product seems neat… it just didn’t perform that well during my tests. 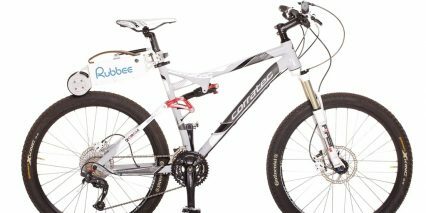 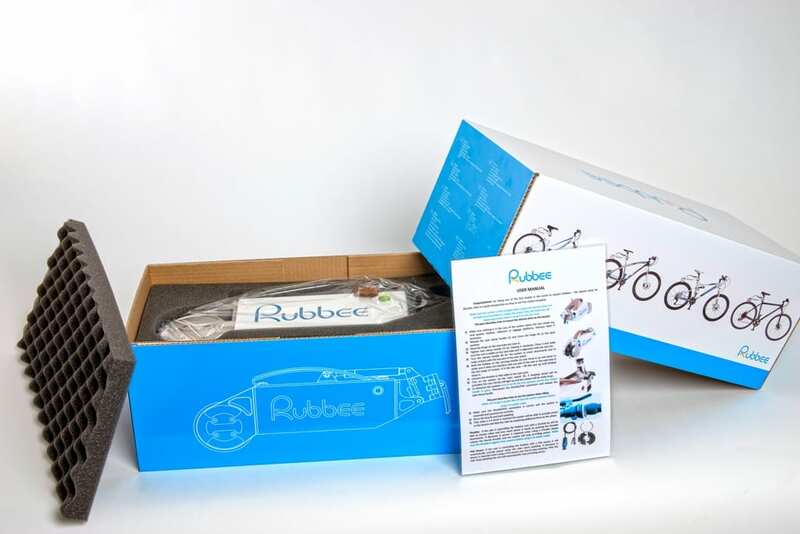 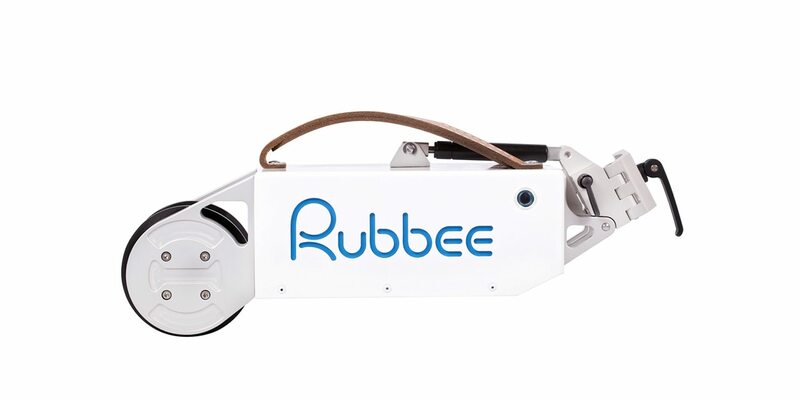 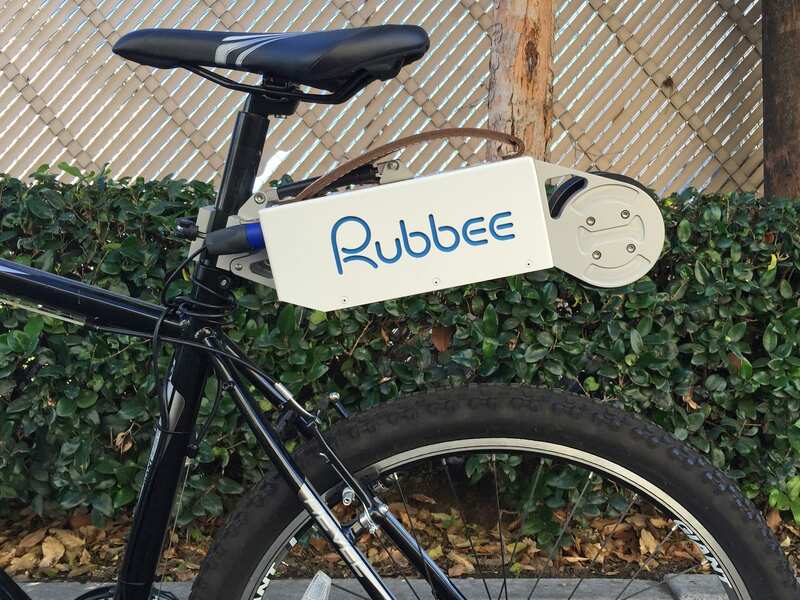 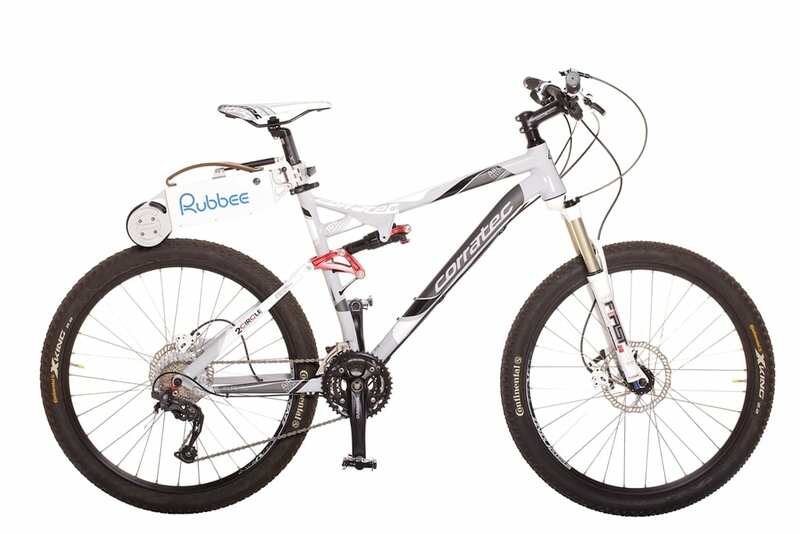 The motor in the Rubbee is a 250 watt gearless canister design that’s mounted inside the rubber friction wheel at the end of the unit. 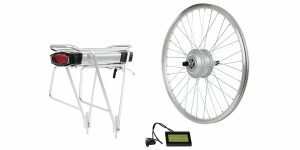 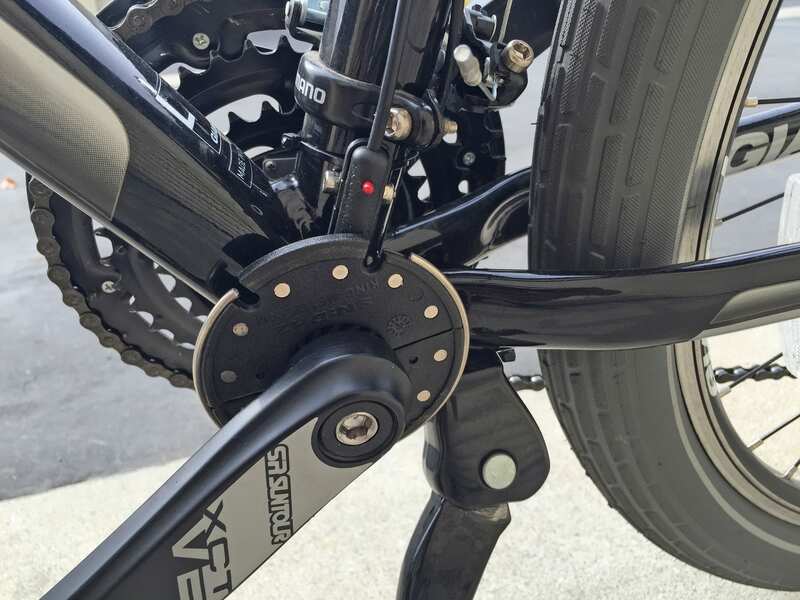 It peaks at 560 watts according to the company and benefits from a huge mechanical advantage, being positioned at the perimeter of the wheel instead of the center like traditional hub motors. 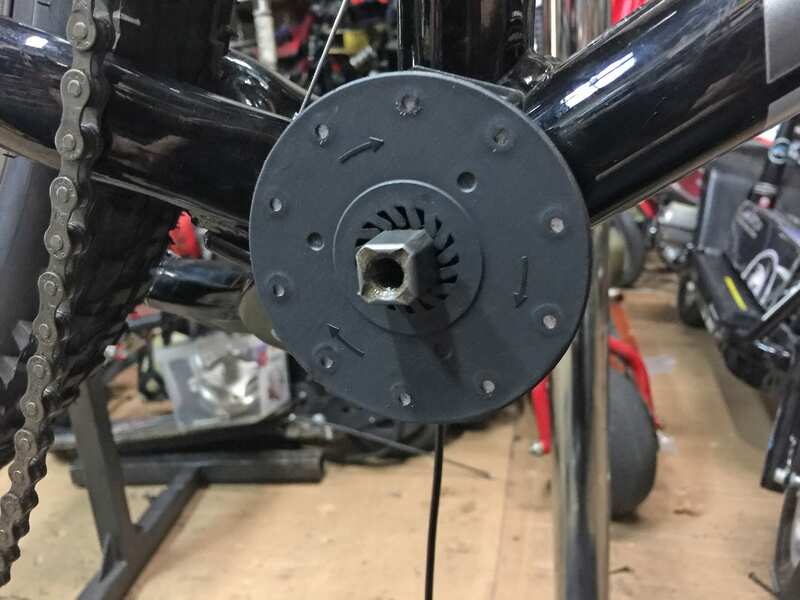 Motor speed is translated to torque and power and it works alright but there is some noticeable whirring (even if the unit is off). 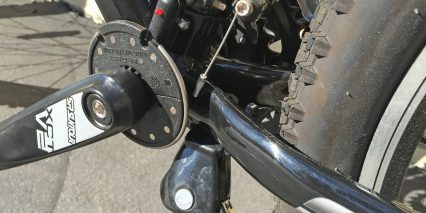 Depending on what tires you use, there’s a noticeable buzzing as tire studs pass the rubber traction point. 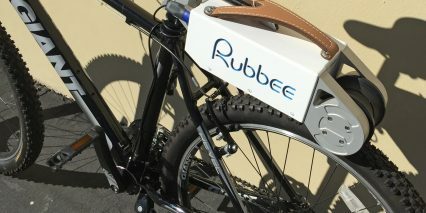 Depending on your weight and the terrain, the Rubbee will shut itself off to avoid overheating which is a neat feature in terms of self preservation. 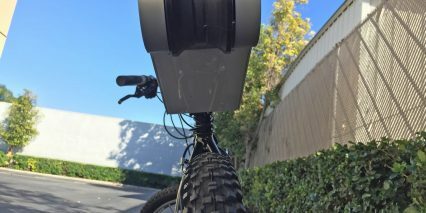 The downside is that you may be left to climb on your own… with the extra weight… and the drag of the motor system which will likely still be engaged with the rear wheel. 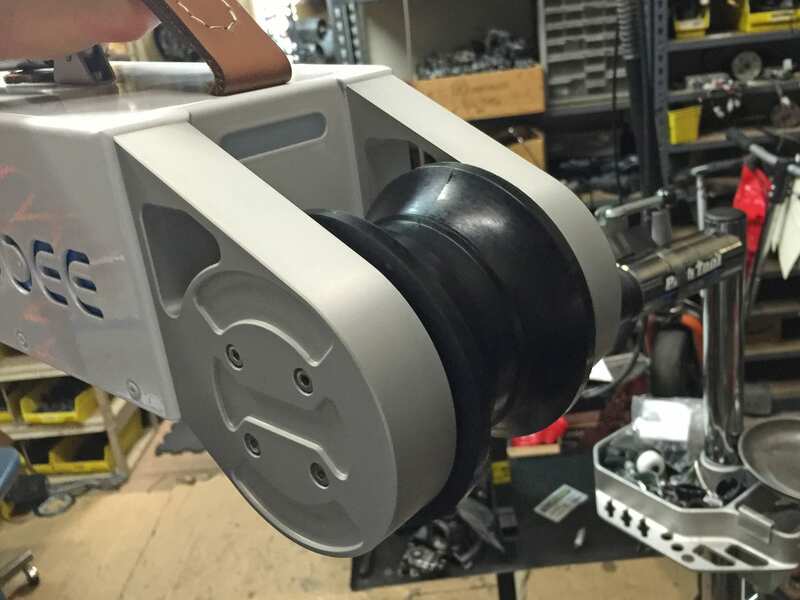 You could always swivel the unit up and disengage but in tern risk braking the pin off as we did. 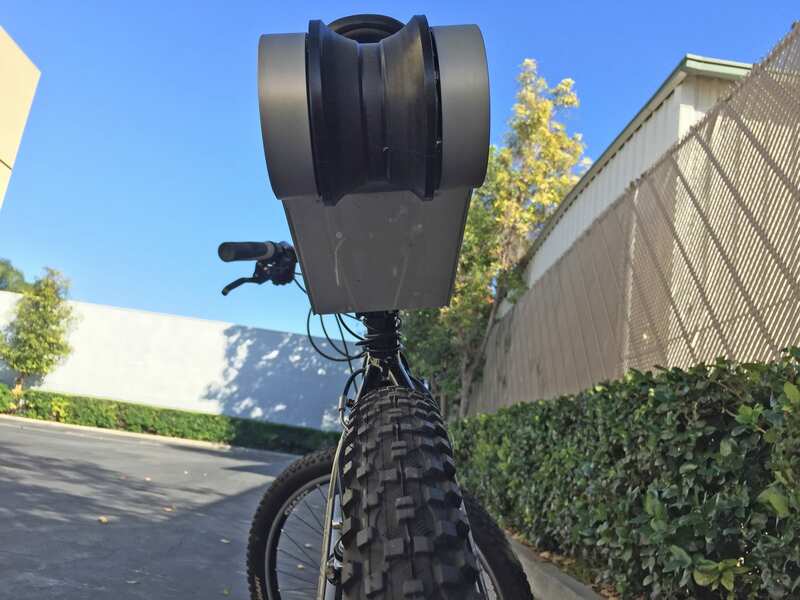 I feel like this is one big area where the unit could definitely be improved. 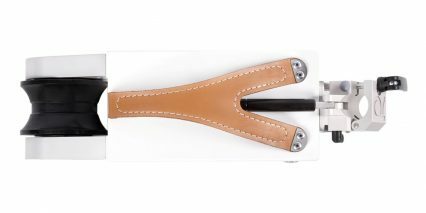 If I didn’t have to worry about the pin breaking I might be able to leave the unit up more often and that would reduce range anxiety. 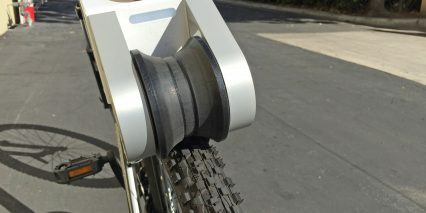 One possible downside is that in the up position, dropping a curb could still stress my seat post. 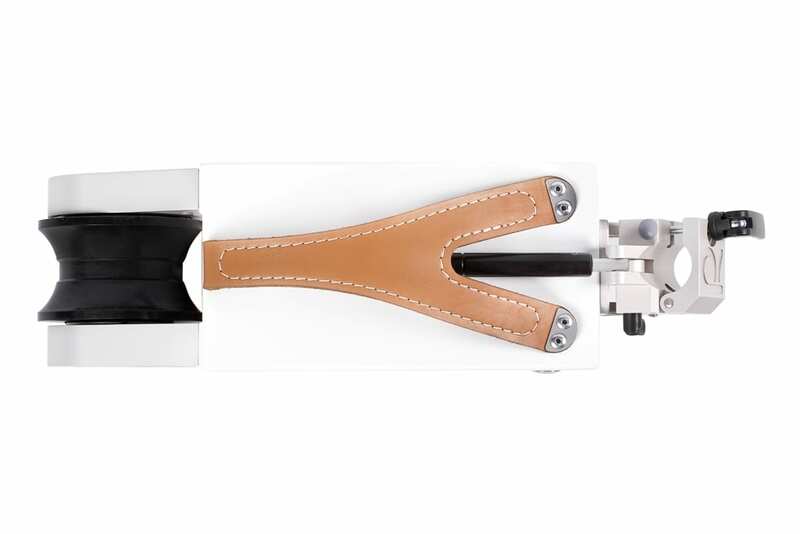 On this topic… I would not recommend using this kit with any type of carbon fiber seat post as you could crack the post. 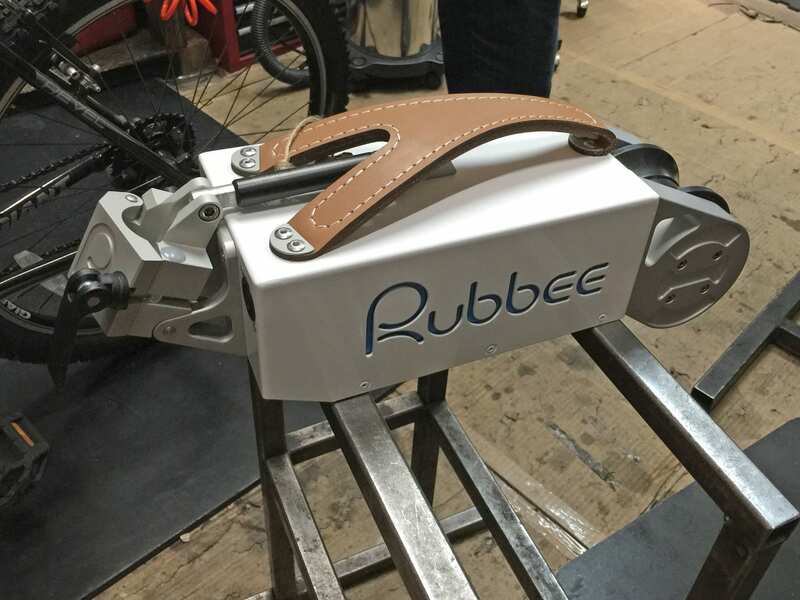 Powering the Rubbee Drive 2.0 is a Lithium Iron Phosphate battery pack offering 14.4 volts of power and 20 amp hours of capacity. 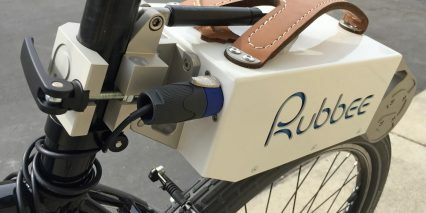 The overall watt hours are decent at ~288 but you’re getting less power with this battery design than a traditional 36 volt 10 amp hour pack found on most other ebikes I review (in Europe the standard is more like 24 volts with 10 amp hours). 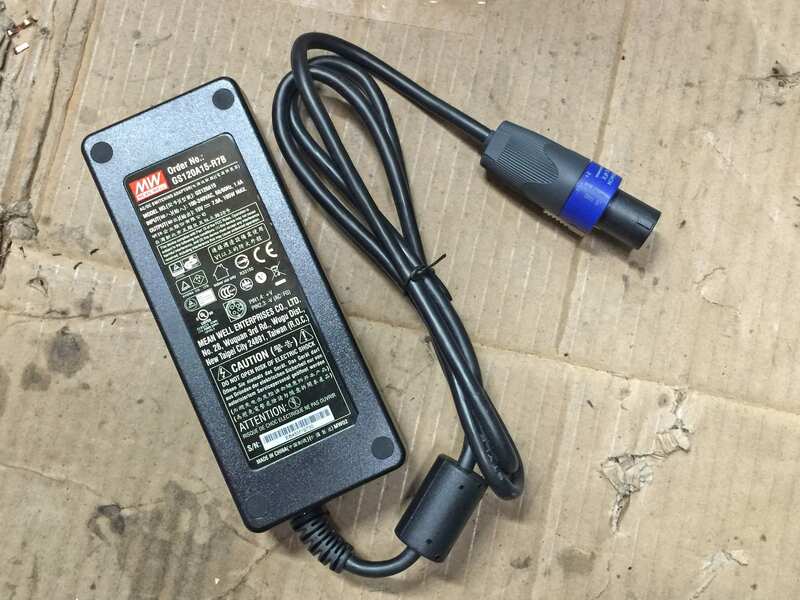 Lower voltage may not be an issue here because of the motor design. 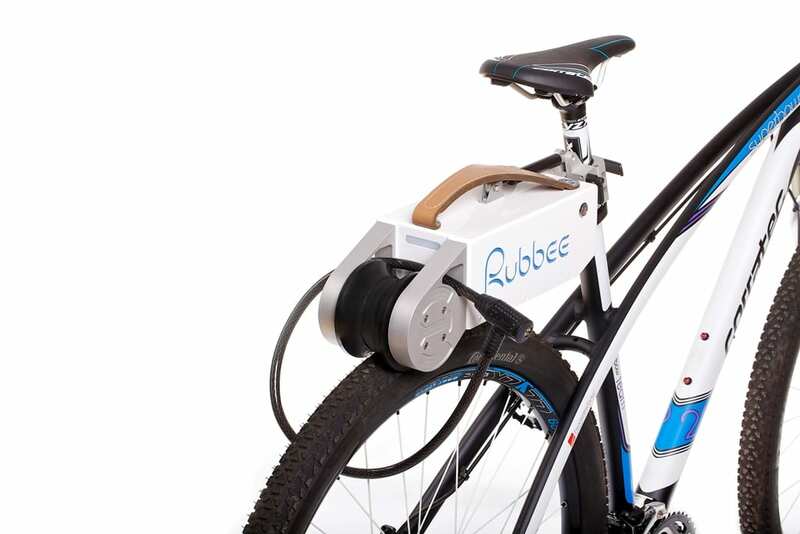 Rubbee estimates that their system will get upwards of 20 miles per charge and this seems right to me given the assist-only design. 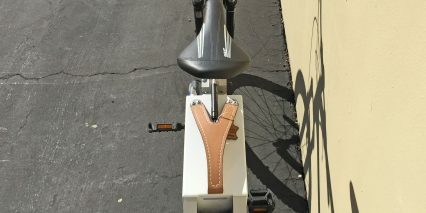 There’s no throttle mode here, you have to pedal to keep it going. 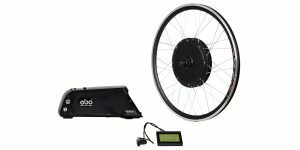 Since they used a cadence sensor here however, I found that you don’t have to push especially hard (after the bike is moving) to get the motor to activate and continue on. 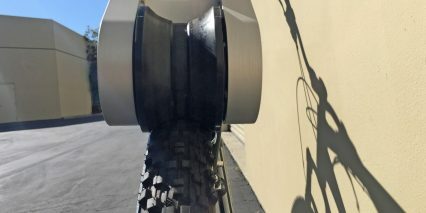 Still, even when it is going, it just doesn’t feel that satisfying. 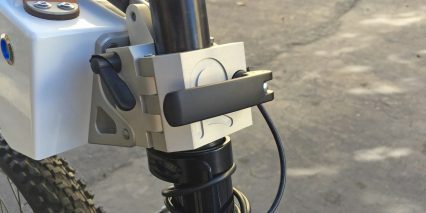 LiFePO4 batteries are known for being durable and long lasting, they make up the majority of the weight on the Rubbee at ~6.5 lbs and since the unit is super easy to clamp on or take off you can easily store them inside (in a cool dry place ideally) to extend their life and charge them up after each ride. 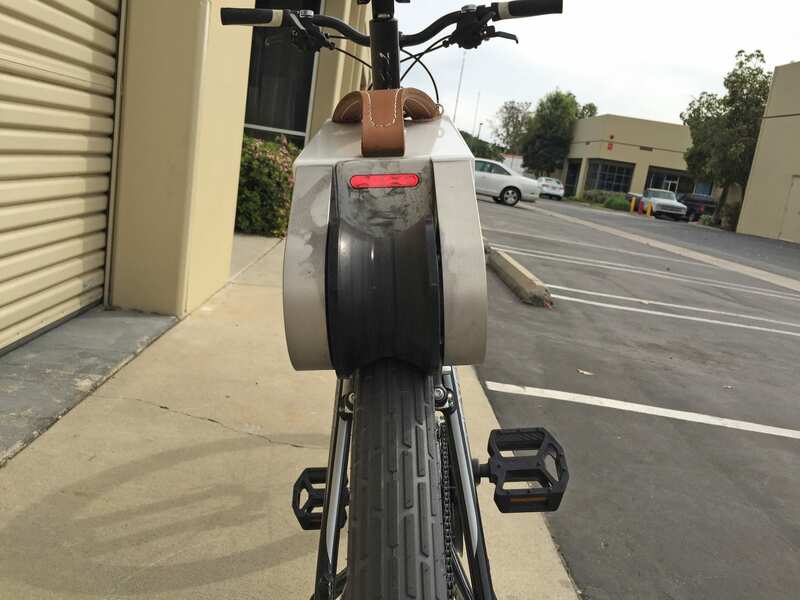 I’m not sure how easy the cells would be to replace or if there’s a program for doing that but after 1,500+ charge cycles the unit may be pretty well worn. 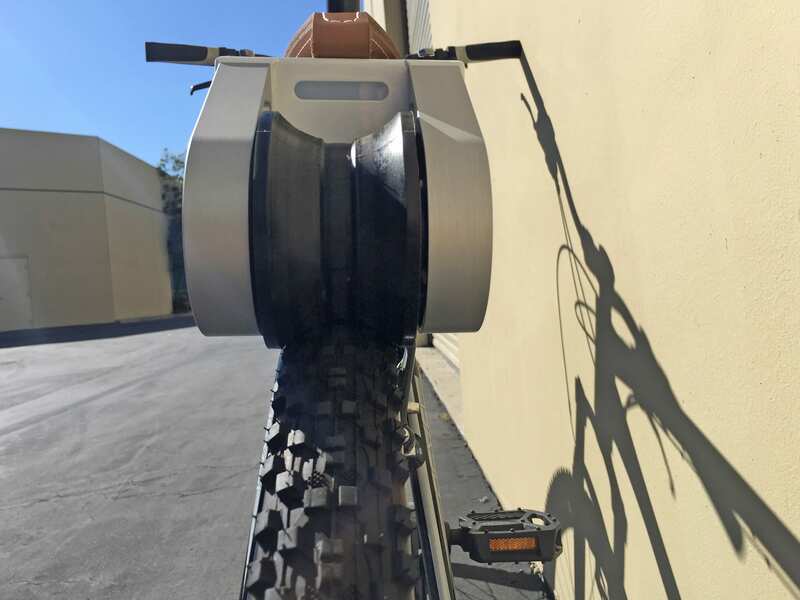 I noticed that rubber dust began accumulating around the back and under side of the unit after less than 10 miles and I’m not sure if that was from the friction roller or the tires? 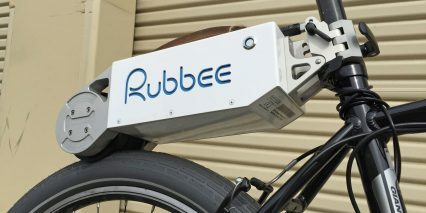 Installing the Rubbee 2.0 pedelec sensor system was fairly easy and did not require special tools thanks to the included half-disc setup. 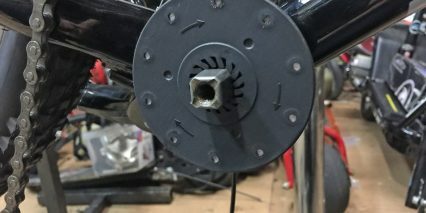 Basically, there’s a circular plastic disc that can be pulled apart along the center and then clicked back together around the crank axle of your bike. 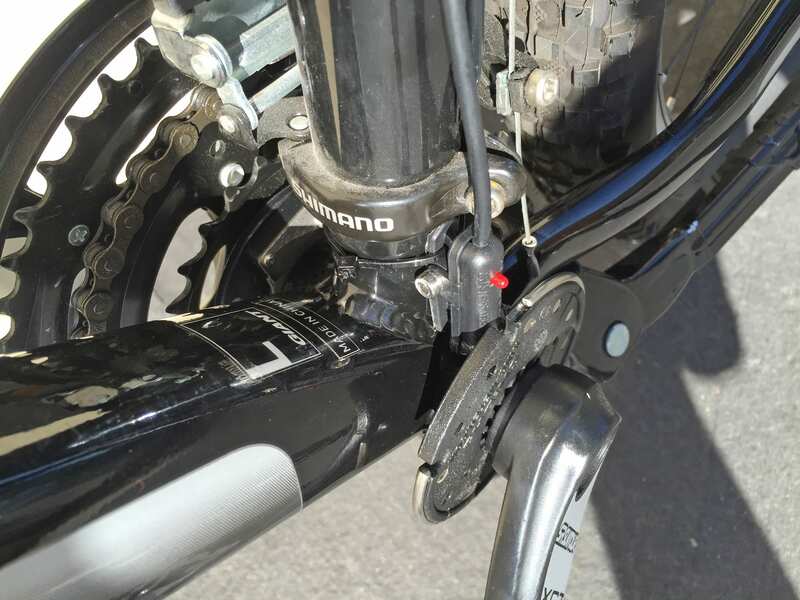 there’s a nice metal c-ring that keeps the two pieces together once it’s mounted and then all you have to do is align the electronic sensor to the magnetic dots by sticking it to the seat tube or chain stay tube. 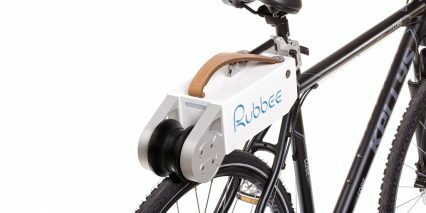 I think the picture below demonstrates it pretty well. 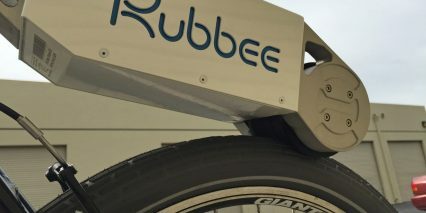 Once the magnetic disc is on and the sensor probe has been secured you can zip tie wires along the downtube to clean up the aesthetic. 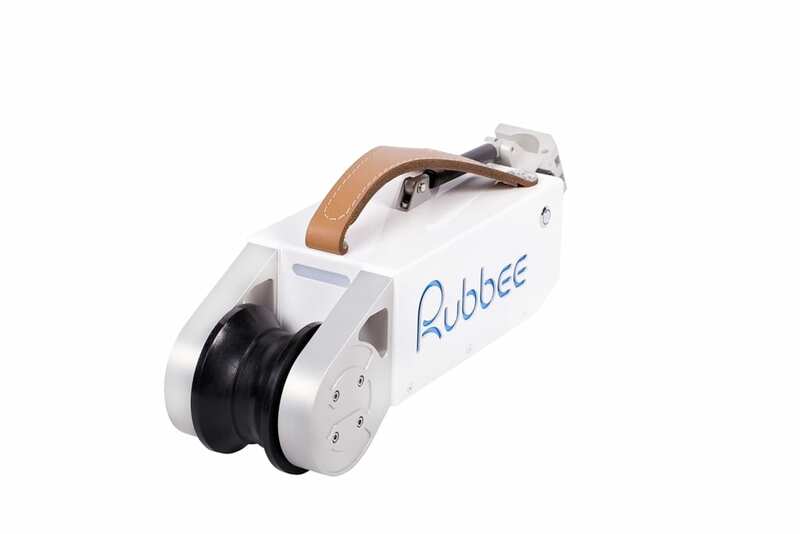 At the other end of the sensor probe cable you’ve got that nice twist-connector which goes into the Rubbee. 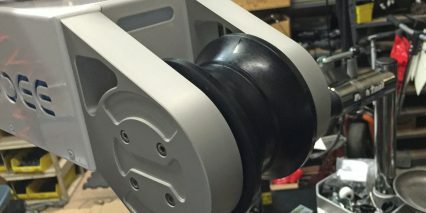 The company had actually sent me two different sensors to experiment with and the snap-on one was way easier and even more responsive than the more permanent version because it only had 10 magnets. 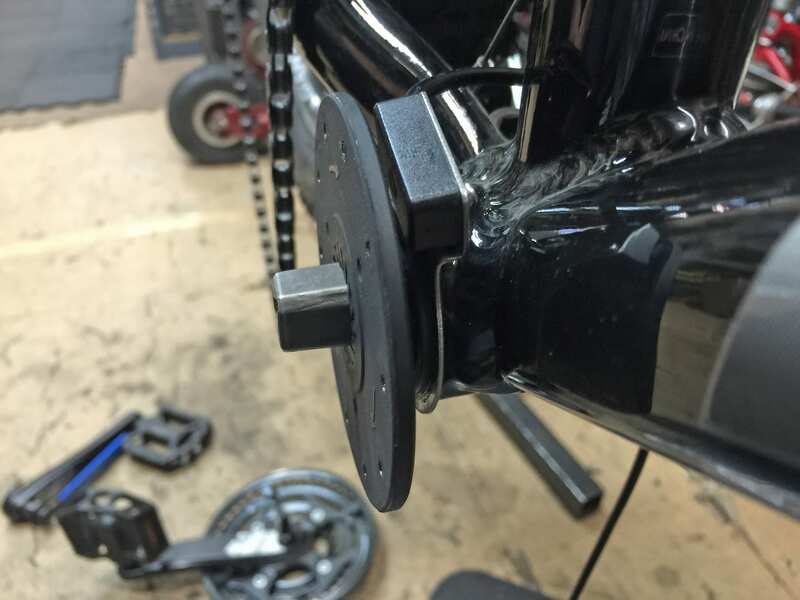 This second system was also a huge pain to install as we had to take the cranks off and use special tools to remove the bottom bracket before installing correctly. 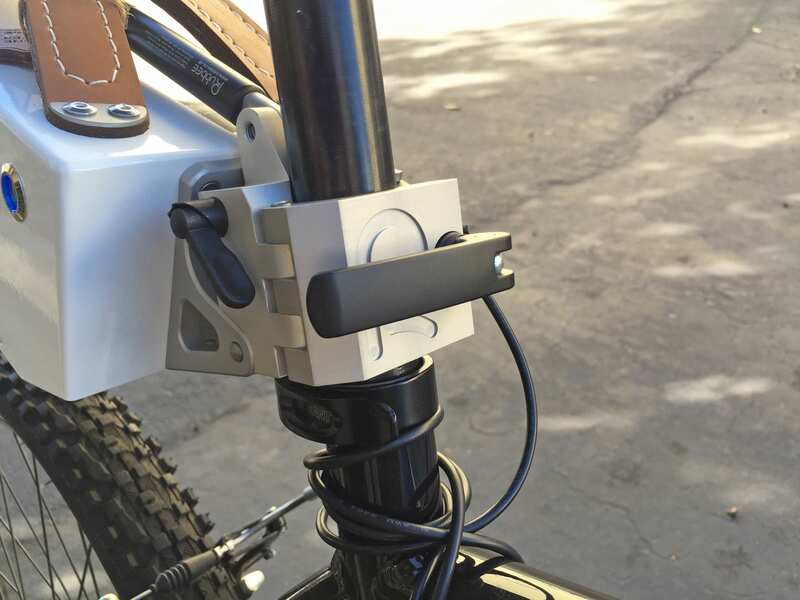 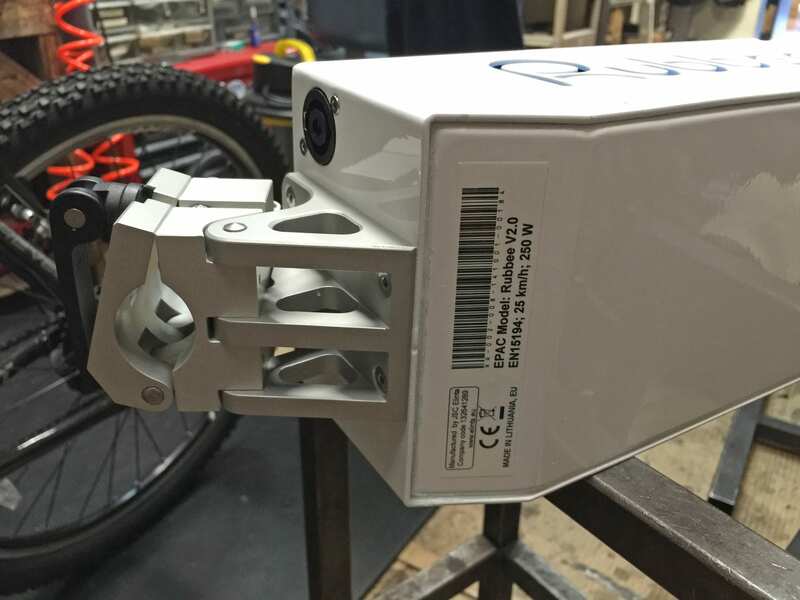 In the video you may notice an extra plug hanging out in some of the shots and that was from this second sensor which we installed on the right side of the bottom bracket. 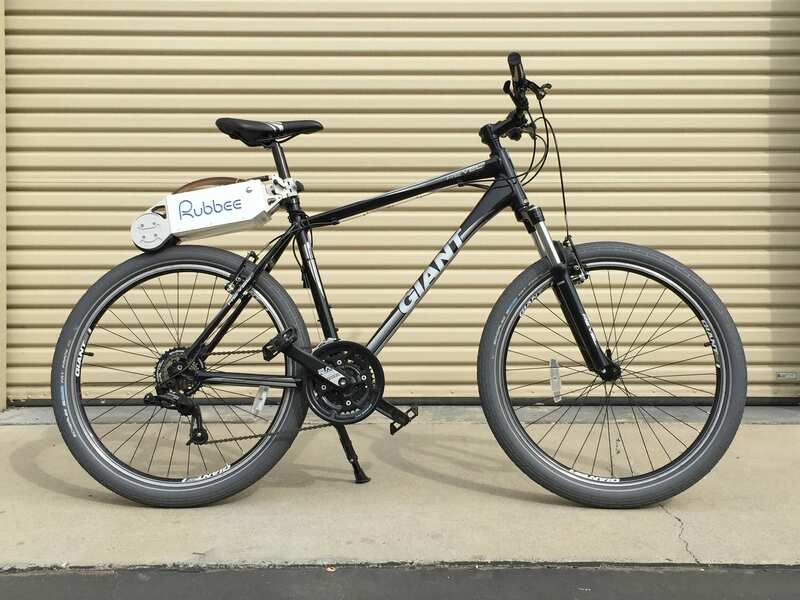 So after installing the Rubbee on a Giant Revel hardtail mountain bike (with 26″ wheels) and then swapping out the standard knobby tires for some smoother Schwalbe Fat Franks (to see how it would reduce noise and improve performance) I just wasn’t that impressed. 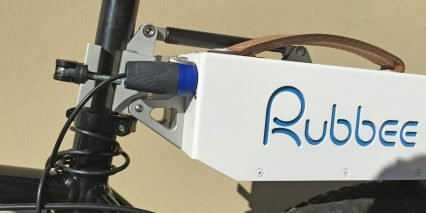 The thing looks awesome and I love the idea of a completely removable, self contained drive unit but the results were lacking. 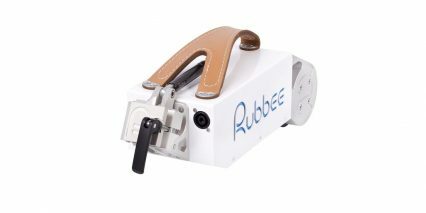 I’ve actually tried other older electric powered friction drive units that rely on the same concept as the Rubbee and had a much better time. 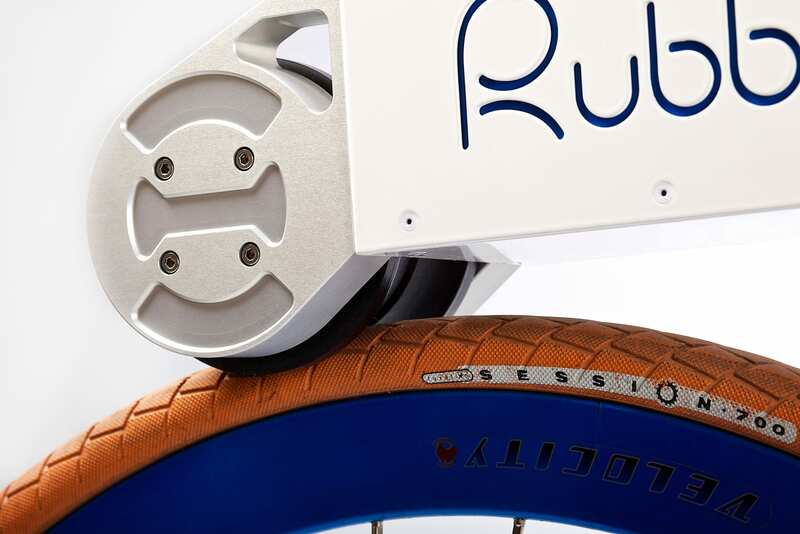 Even if it wasn’t able to hit 20 mph which is the standard in the US if they could make it zippier, make that rear wheel freewheel instead of causing drag and fix the vulnerable pin system that broke for us I would like it much more. 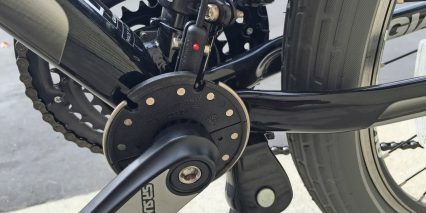 I’m told that the unit rides more smoothly and drag is reduced after a while because the bearings in the motor loosen up. 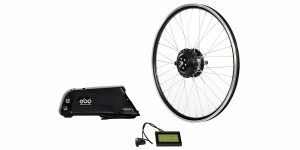 This is definitely a niche product and there are solid purpose built ebikes out there for ~$1,500 or you can experiment with other devices to convert your existing bike. 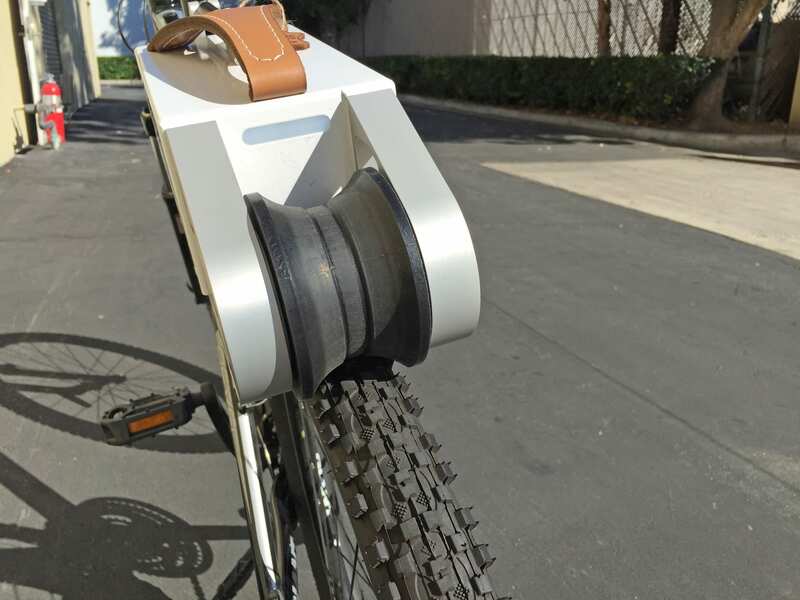 I like the idea of using this with a folding bike, a full suspension mountain bike or anything in between but just because it could be used this way doesn’t mean I’d choose to do so after having experienced what it’s capable of. 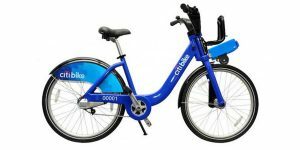 If you’re interested in this unit and live in America, check out Greenpath Electric Bikes in New York City which is one of their distributors. 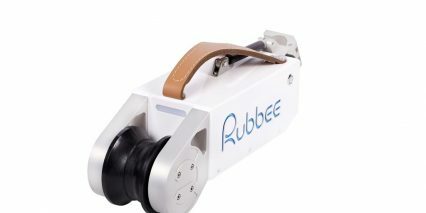 I was interested in the Rubbee electric assist motor, but after reading all the comments from people that have purchased this item it looks like one to stay away from. 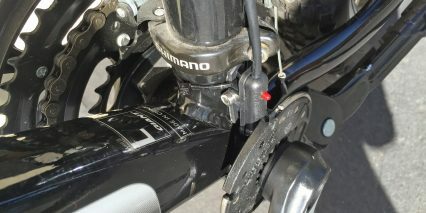 Too many people tried to return them, faulty switches, stuck power switches etc. 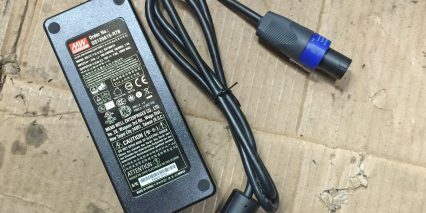 I decided to forget this item. 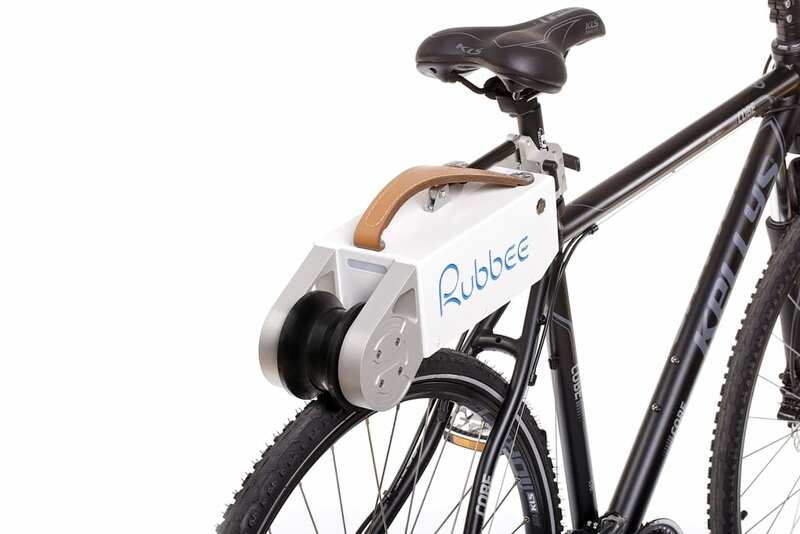 Too bad, it looked like a great idea………oh well. 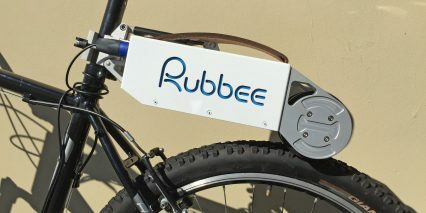 Here is another one that just was launched on Indiegogo. 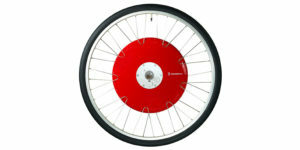 I just ordered the smallest version to try on the front wheel of my Magnum Ui5 for some more oomph on hills. 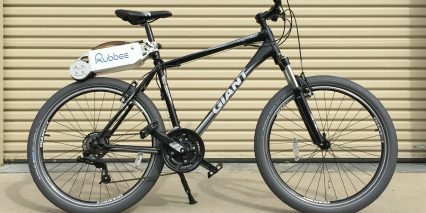 I look forward to trying out an AWD ebike! 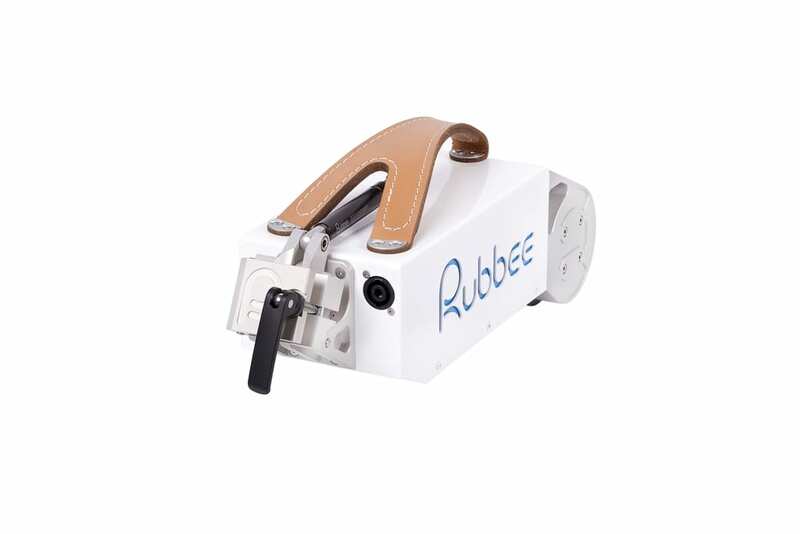 It would be great if you could get a hold of one to review. 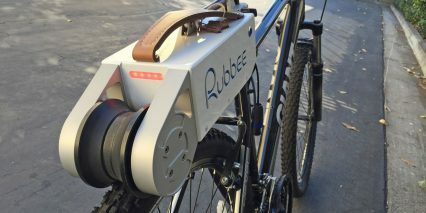 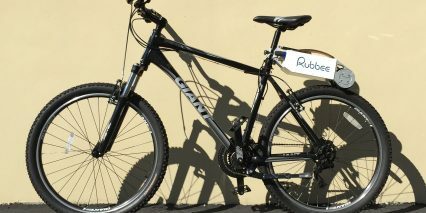 Where can I see a Rubbee Drive . 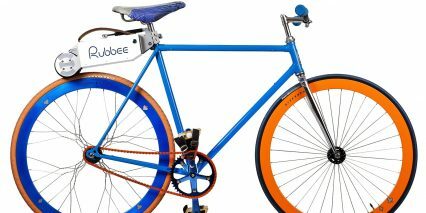 I live in New Jersey. 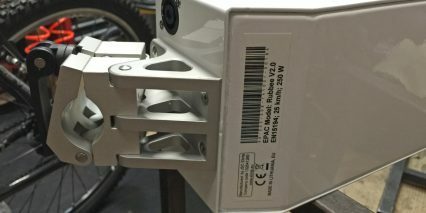 Hi Michael! 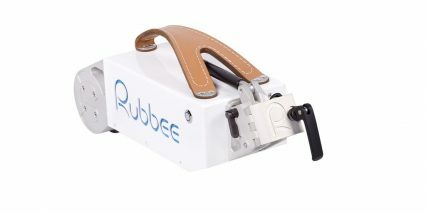 I can’t speak on behalf of the Rubbee company but you can reach them via their website here http://www.rubbee.co.uk/contact and if nobody responds just email me using the contact form on EBR and I’ll try to make an introduction. 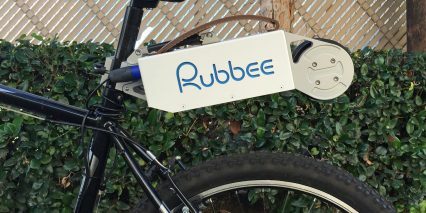 Sounds like a very cool project!